In 2014 Italian punks The Nuts released their self titled EP. It gave the world four short and sharp pieces of female-oriented Ramonescore that set the band out as one to watch. Even in a world awash with similar bands, there was something about The Nuts’ gutsy performances and love for the style that made them truly stand out. There was something in the energy of the EP format that suggested a full-length might not have quite the same impact, but any fears of a longer disc not having quite the same punch should be cast aside, as ‘Upside Down’ tears through ten numbers in just under twenty minutes, leaving precious little time for any filler or room for error. With speed being very much of the essence, The Nuts’ return sets out to wow with a pure drive right from the start and the album opener ‘A Night With You’ quickly capitalises on everything that made the EP great. It’s slightly spacious intro presents hard and treble drenched guitar chords that evoke more of The Only Ones than the Ramones. Soon enough, however, the drums hit upon a speed that dictates a far more aggressive approach and the guitar and bass parts quickly fall in line with a spiky riff that captures a similar excitement to the EP. This is a step up for the band in terms of performance, though: the punk is interspersed with superb vocals that deliver from the more anxious end of the power pop spectrum in places, and the way Vale and Palmi harmonise is absolutely joyous. Coming together on lines like “make you mine tonight”, there’s a carefree edge of 60s girl group traditions at play, which make an excellent contrast with the fiery Ramonescore sound that’s very quickly escalated. The simplistic punch of ‘On The Edge’ rivals fellow Italians The Apers, especially in the way Vale’s voice curls around each syllable in a slightly yelpy and unapologetic fashion, but more so than ever, she sounds like the consummate frontwoman, able to deliver a performance that straddles the tricky thin line between passionate and throwaway, while the rest of the band motor at speed. Vale’s own bass sound on this track is superb and the way the speed-driven riffs lock in with a frivolous drum part result in essential listening. Cranking the speed a touch more, ‘Can’t Seem To Get Away From You’ is an obvious tribute to Screeching Weasel with a great descending riff leading into a sharp and melodic riff that allows a twangy lead to fill spaces. It’s vocal simplicity is also its best strength, allowing broader notes to carry a catchy chorus. Dishing out some shameless “whoah-whoah”s to punctuate the bulk of ‘Cooler Than You’, the band sound glorious on a pop-punk by numbers affair that shows a little love for The Muffs and Halo Friendlies, mixing great riffs with slightly atonal soloing, before the short ‘My Heart Is Cracked In Two’ changes the mood. Occasionally sounding like a much more focused take on something from Shonen Knife’s ‘Pop Tune’ LP, this is another corker, but don’t expect any quirks or surprises within. That said, who needs surprises? 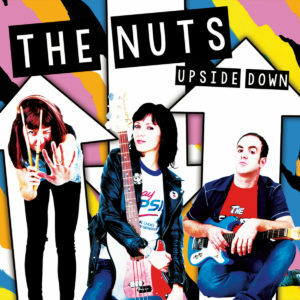 The Nuts’ energy and love for melodic punk shines through to make it an easy album highlight. The use of harmony vocals and a cheeky glockenspeil accentuates the Shonen Knife-isms throughout ‘Cry Baby’, which along with a defiant nod to Phil Spector productions within Palmi’s drum work and some top harmonies signifies this as an instant classic. For fans of the style, one play will be all that’s needed before it asserts itself as gold standard punk, while ‘Secret Words’ brings a world of sharp chords set against another curly vocal. More spacious than some of The Nuts’ material, it pushes Molbi’s bass to the front and has a slightly fuller sound, something in turn that really boosts a retro chorus hook. A couple of musical breakdowns tip the hat to Ramones classics more than ever, so with everything considered, it’s a great piece of melodic punk rock. Less pop, the guts and speed of ‘We’ll Be Fine’ makes a return to the Screeching Weasel and Manges catalogues for its chief inspiration, but as before, its familiarity makes it great and Molby’s angry and unrelenting guitar work throws out chords with a wrist-breaking fury. Moving towards the end of an already essential LP, ‘The Flight’ borrows a few obvious Weasel inspirations in addition to tipping the hat to classic Ramones tunes (‘Beat On The Brat’ being one of the more obvious), before fusing the punk with more bubblegum pop for an epic closer, ‘All You Can Do’. Hugely reminiscent of The Muffs at their best, this improves as it progresses, eventually offering a selection of incredibly infectious whoahs to fade. With ten songs delivered with utmost confidence and sheer style, ‘Upside Down’ is an exercise in power, melody and brevity. Pop-punk 101 it may be, but The Nuts clearly understand that great musical models are great for a reason and as a result, this album rivals the best works by The Apers, Manges and so many better known Italian bands. It’s a shame, then, that The Nuts went their separate ways just a short time after this release; on the basis of this, they had the makings of one of the very best Euro punk bands of the era…possibly as good as any since the birth of punk almost four decades earlier. If fairly straight Ramones obsessed sounds are a favourite, you need this album. Buy it on vinyl; grab the download; whatever your choice of medium, this one will feel like an old friend in no time. The Nuts will be missed, but at least they left us with something of a genre classic. This entry was posted in Album & EP Reviews and tagged italy, monster zero records, pop punk, punk, ramonescore, stream by Real Gone. Bookmark the permalink.